An impression of wind is created with a school of fish and aquatic plants. 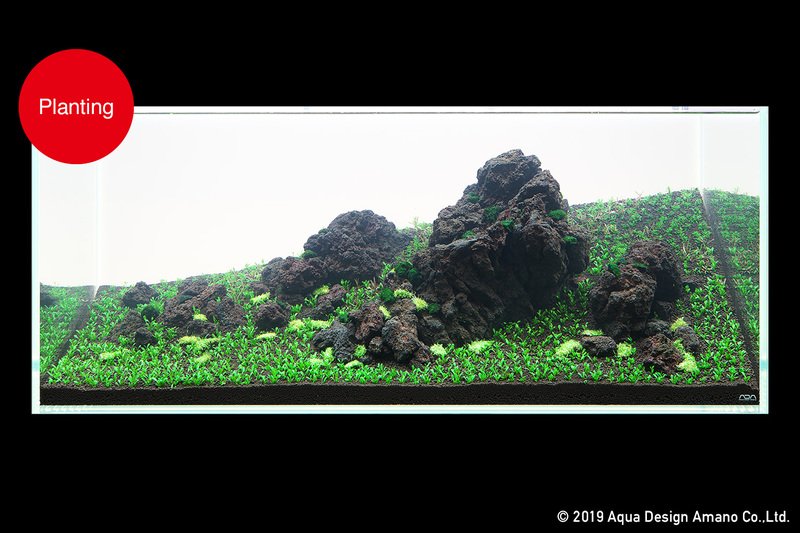 The aquascape invokes the impression of the flow of time with the scenery of crumbled rocks. [The Flow of Time] Pine forests, beaches, sand dunes, and reef stretch across the long shoreline of Niigata prefecture. 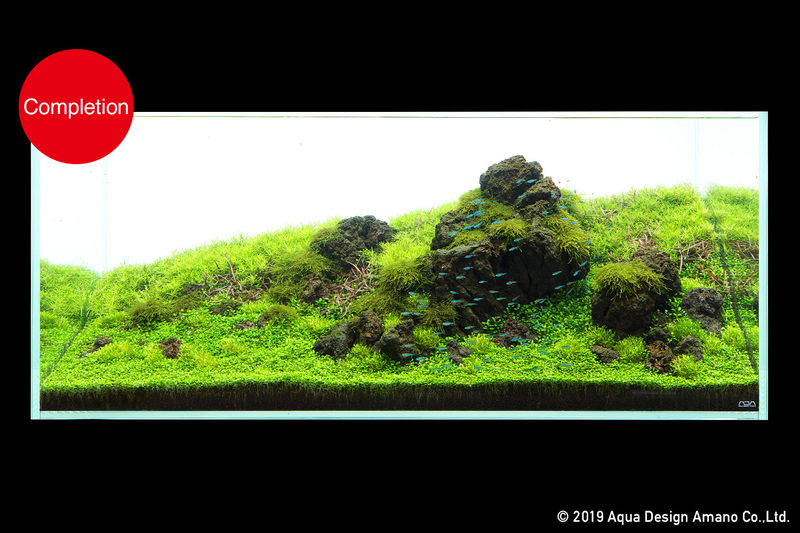 This aquascape is based on the landscape of Kohama at the foot of Kakuda Mountain. 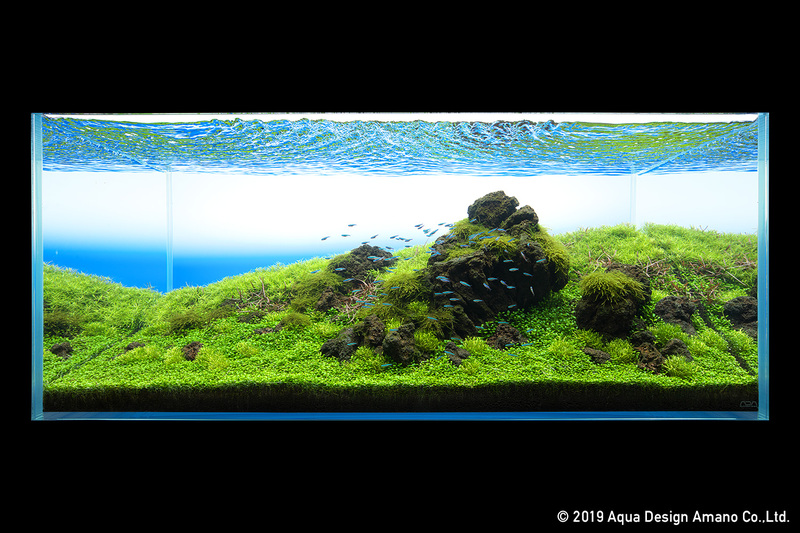 Since the wind from the ocean blows hard in Kohama, creating an impression of wind is crucial for this layout. However, it is difficult to do so underwater. 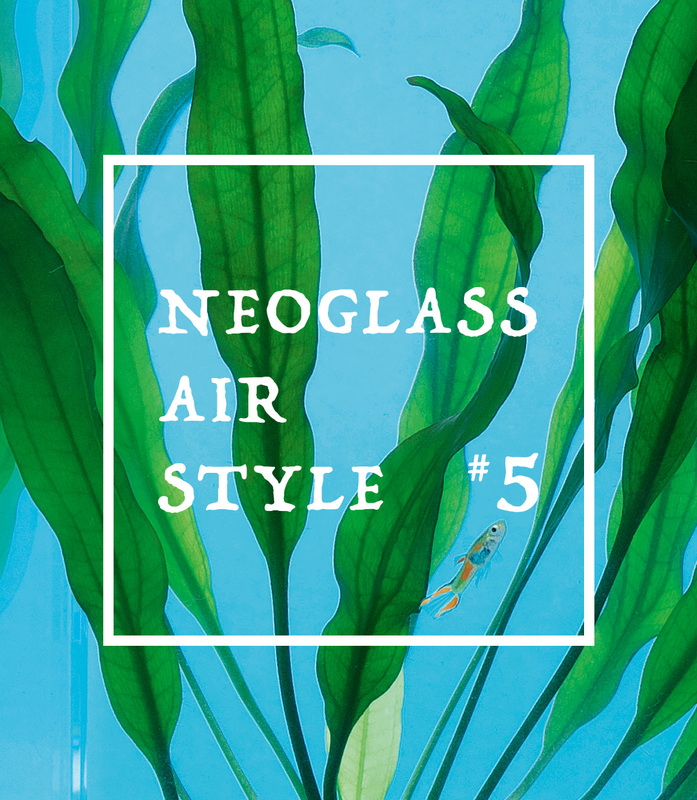 Therefore, a school of Paracheirodon simulans was used to visualize invisible wind and the aquatic plant was used to depict a grassy field swaying in the breeze. Yougan(lava) stones produced the appearance of an undulating hill, and the slope was produced by mounding soil. I expressed an impression of the flow of time with the scenery of stones that have crumbled and weathered over time by wind and water. The strong light and dark contrast of Yougan stones and the planting of aquatic plants recreated the scenery of wilderness. 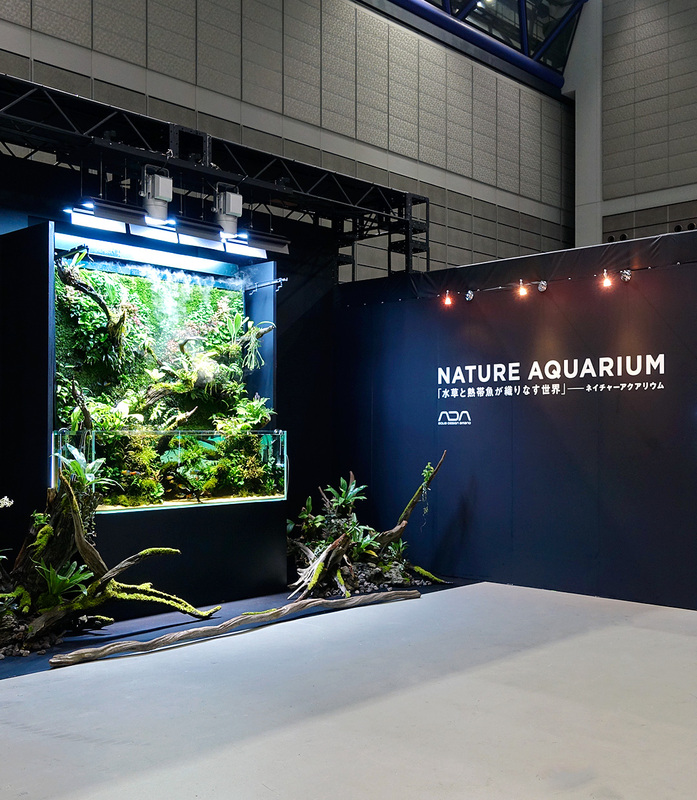 Nature Aquarium is produced by forming the image of “nature” in mind. The “nature” may be an actual natural scenery, or it may be produced by extracting the essence of various natural landscapes and recreating an abstract “nature.” This layout, which belongs to the former type, was produced by imagining the scenery in Niigata displayed on the under. It depicts the wilderness with rugged Yougan stones and mounded soil and the appearance of weathered and crumbled rocks using the larger stones with deep shadowy areas and some small stones. 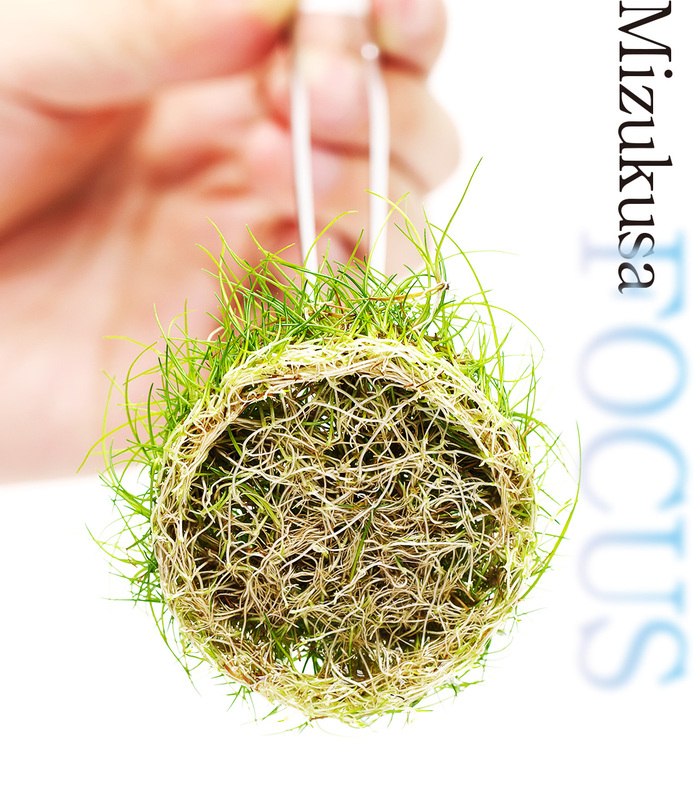 Additionally, the plants in the layout are comprised of BIO Mizukusa No Mori series plants. These plants are perfect for beginners since they are easy to grow, sturdy plants. 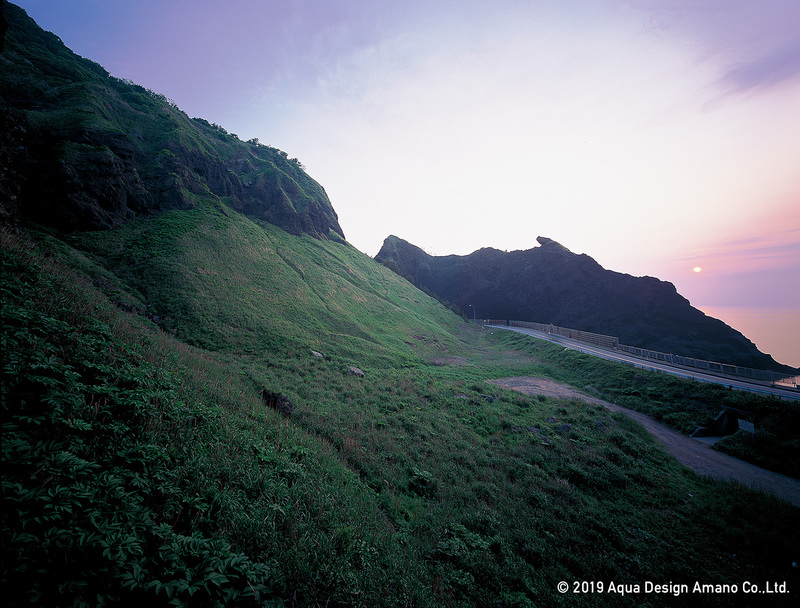 The scenery of wilderness with rocks scattered in a grassy field spreads over the slope that stretches from Kohama to Kakuda Mountain. Strongly epiphytic Willow Moss(Taxiphyllum barbieri ) was wrapped around a small stone and placed in the depression of a Yougan stone. 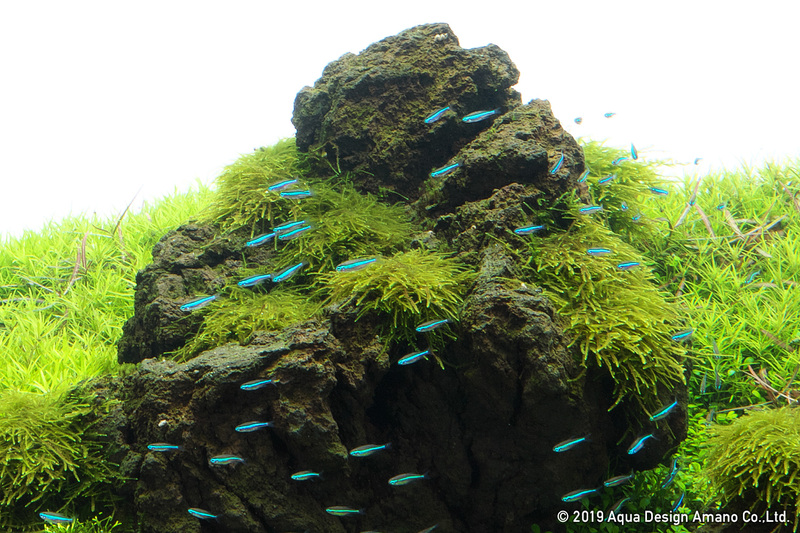 Although mosses are considered to be less demanding of nutrients, they grow well and look attractive when Green Brighty Nitrogen is added. 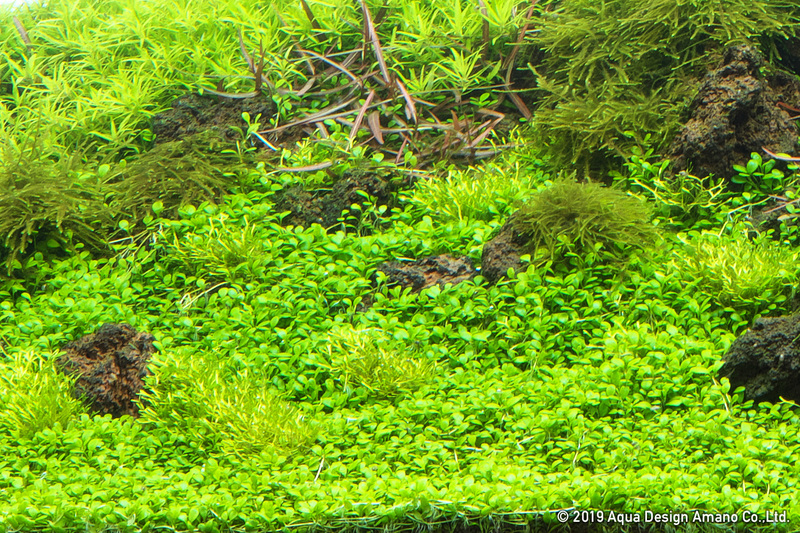 Since Caridina multidentata and Crossocheilus oblongus occasionally feed on mosses, their numbers need to be reduced at the first sign of damage. Hygrophila sp. “from Araguaia Red Sharp Leaf form” was planted in between Glossostigma and Scrophulariaceae sp. 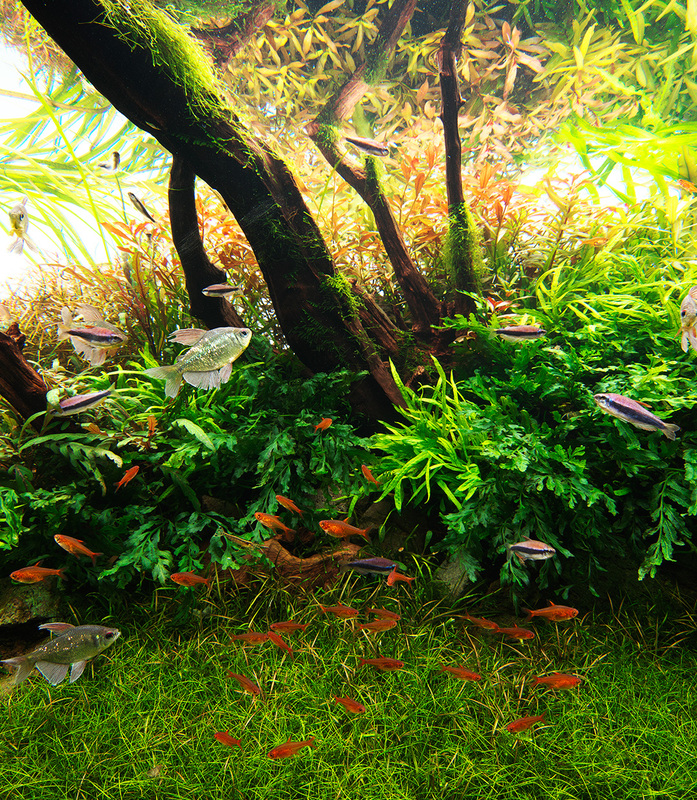 The distinctive red leaves that show through the sea of green create a nice accent in the aquascape. 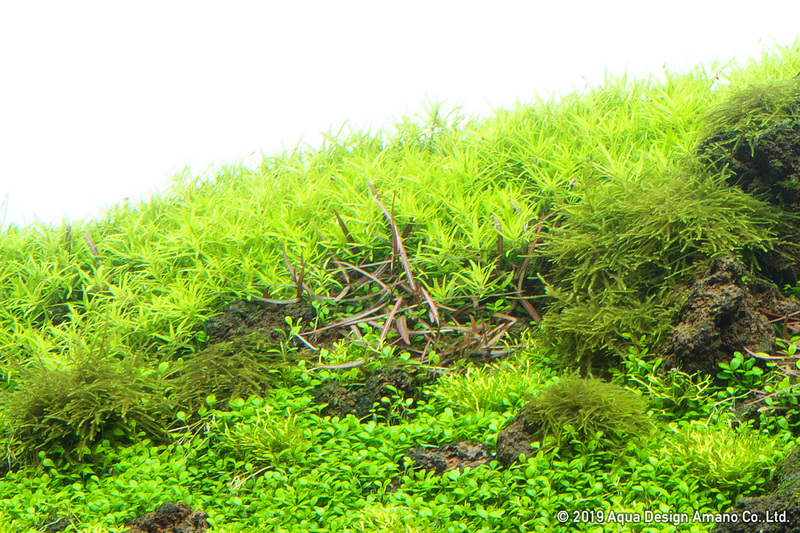 Since this aquatic plant grows slowly, it was left untrimmed to grow gradually. Riccia was trimmed once every two weeks since it is sturdy and grows fast. Glossostigma was encouraged to grow dense through trimming. It is kept short near the front of the aquarium and somewhat longer around the stones. 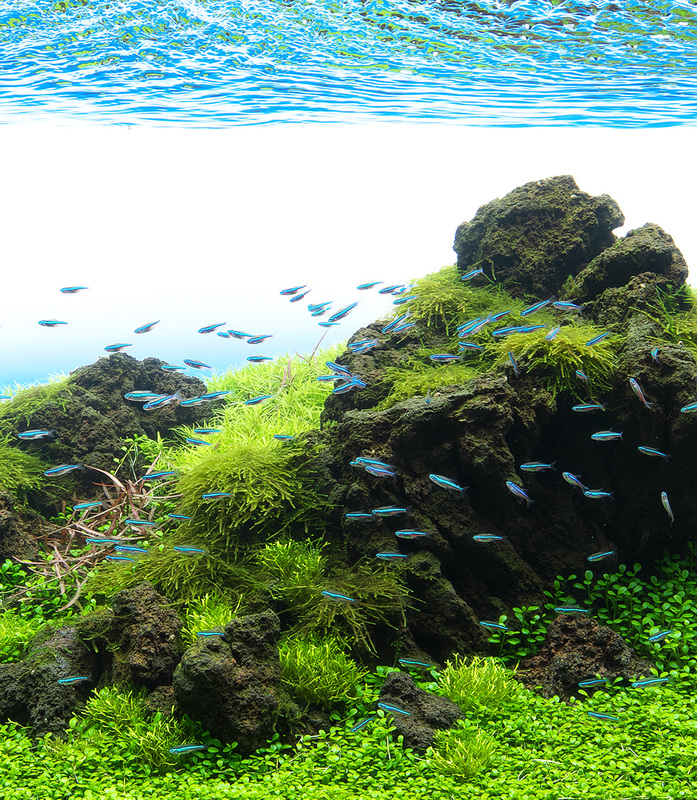 This aquascape was modeled after the scenery of Kohama in Echigo Nanaura beach. 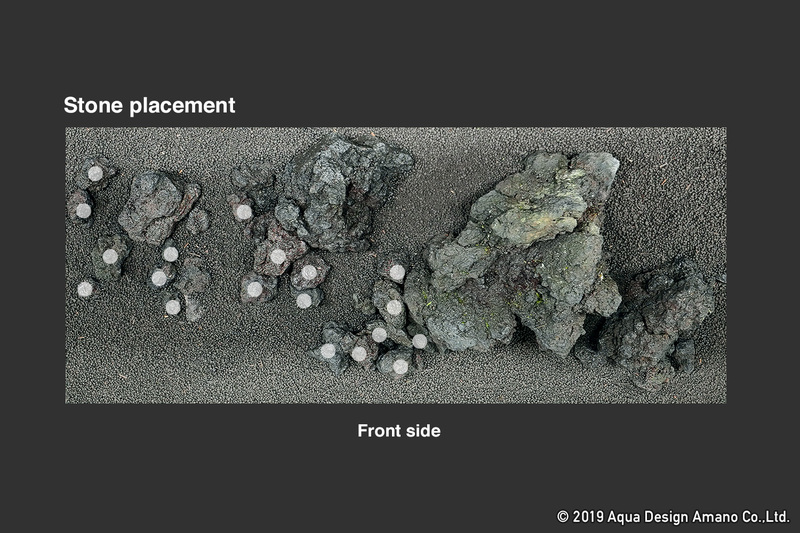 To recreate this windy seaside area, smaller stones (marked with ●) were placed on the left side of the larger stones to create the image of crumbled rocks and the impression of wind blowing steadily from one direction. 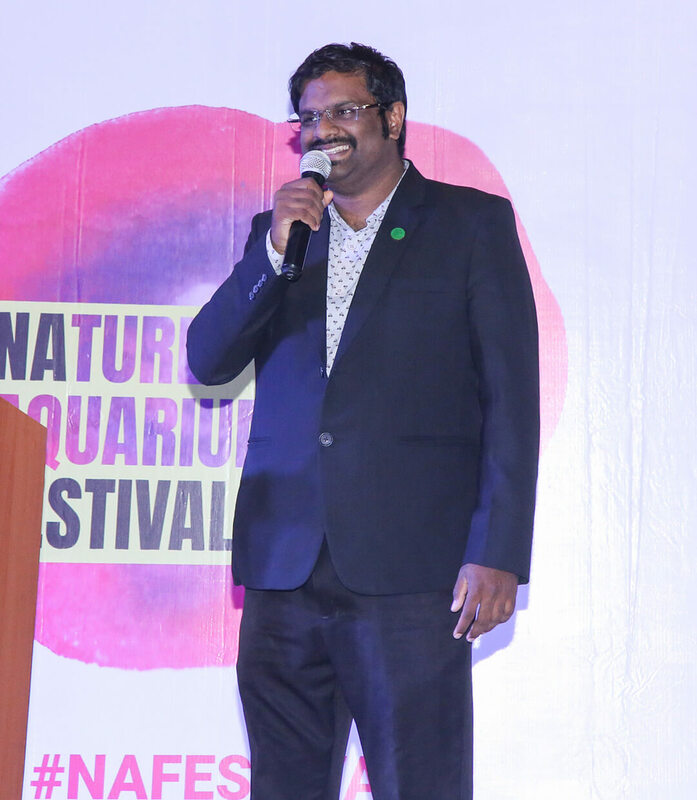 Short aquatic plants were selected to produce the image of a grassy field in wilderness. Plants with different shapes and colors of leaves were chosen depending on the area to give variation in planting. Photographed on November 15, 2018.